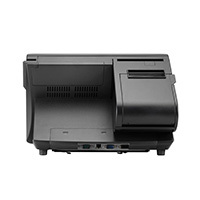 A mid-range all-in-one POS Terminal with built in receipt printer and optional customer display, the PT-6315 is a high-performance business all-in-one. The Celeron 1.8 GHz dual core processor of the PT-6315 handles the majority of POS software, and its fanless design and plug and play set up make using the PT-6315 a breeze. The PT-6315 is a very compact all in one system, that fits an entire point of sale set up into one unit that easily sits on top a cash drawer. The modular design with optional customer display and MSR makes adjusting the PT-6315 to your point of sale set up easy. 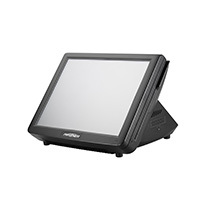 The Partner Tech PT-6315 all-in-one POS terminal is an easy to use, inclusive touch screen terminal. Dimensions (W x D x H): 14.5" x 10.2" x 11.4"